Latest Update, Audison have now entered the BMW Bespoke Speaker Upgrades, see below for our latest BMW packages. Here at John Kleis Audio we have considerable experience with BMW’s and upgrading the inadequate audio systems in them. 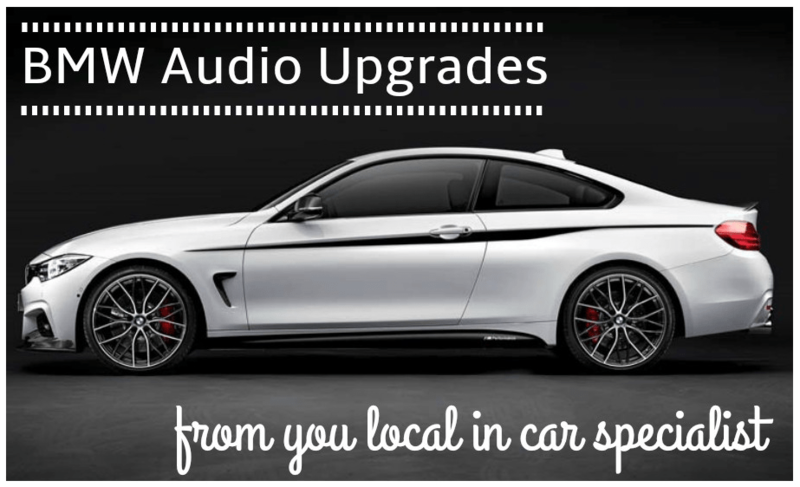 It’s such a popular manufacturer here for audio upgrades that we have obtained a BMW 4 Series to showcase a few of the options we can offer people. You own a great car which deserves a great system to match it. It is here almost every day the shop is open and is worth a listen to open your eyes (or ears!) to what can be achieved in these cars without actually seeing anything. Most BMW’s, i.e. 1, 2, 3, 4, 5, 6, 7, X1, X3, X4, X5, X6, Z4 & Mini’s all share nearly identical set ups. This is a 4” speaker in the front (sometimes not even tweeters are installed), 6” mid bass drivers under each front seat (so quiet we’ve given them the nickname, the ‘ghost woofer’) and a set of 4” speakers in the rear. If you own any of the cars above get in touch and enquire about either of the set packages below or we can tailor something that is more specific to your requirements. This consists of upgrading the front door speakers. First we soundproof the door cards to give the speaker an improved environment to work in and reduce resonance. We then replace the basic 4” speakers with the Audison 2 Way Component System. This kit consists of a 4” midrange and tweeters with passive crossovers. We either flush mount the tweeters in your factory mouldings or for the proper original look we can order in factory tweeter housings directly from BMW. All speakers plug directly into factory wiring so there’s no need to cut any cables. This gives you a far clearer sound and superior separation. We do this package for £449.00 fully installed. As we are a Four Master Dealership this is all covered under a 3 year warranty. This consists of Audison 2 way Component System alongside a 4 Channel Amplifier. This will give the front speakers more control and more power. In turn meaning audio quality is improved even further at all volume levels and should you wish to, you will have a far more powerful & louder listening experience. The Amplifier will also run the factory under seat speakers to make them more defined and controlled. This package is £1099 supplied and fitted. This package is fully covered under the Four Master 3 Year warranty. As featured in our BMW 4 Series Demo Car this is our most popular package. This consists of fitting our package 2above, plus Replacing the factory 6” seat speakers with the Audison Prima 8” Bespoke BMW woofers available in either 2ohm or 4ohm impedance for improved system composition versatility.We then power all these new upgraded speakers with the Hertz Mille ML4 Amplifyer. The Hertz Mille Power is redefining Class D amplification. With new hyper-efficient chassis design, the compact case size belies the brutish power available inside. Balanced high-level inputs ensure noise is kept to a minimum. This four-channel specimen can be run in four, three or two channel mode and is 2 Ohm stable. Bypass, Hi pass and Lo Pass filters are all included. This system needs to be heard to be believed, which can be listened to via appointment in our own BMW 4 Series. This package is 1749.95 supplied & fitted. This package is fully covered under the Four Master 3 Year Warranty. To get the most out of your system, be it our Package 2 or our Package 3 or any amplified audio system, a DSP is a must. The Audison Bit Ten is a multi-function digital sound processor featuring analogue input, capable of transforming ordinary OEM (original equipment manufacturer) into a high performance audio system. Provided with a 32 bit, 147 MHz clock speed DSP as well as 24 bit A/D and D/A converters, Bit Ten is controlled by a software especially developed for signal treatment according to the vehicle acoustic peculiarities. Setting the parameters of each input single channel, setting the delays according to the listening position, adjusting crossovers and equalizers for each of the 5 output channels; all of these operations can be managed by the PC. during the installation phase, after converting the analogue signal into digital, bit Ten automatically reconstructs a digital full-bandwidth stereo signal; de-equalizes the frequency response and, if necessary, reconstructs the central and subwoofer channels. The difference between a processed sound and non-processed sound can also be demonstrated in our BMW 4 Series to show just how much of an improvement it makes. This adds a cost of £499.99 fitted to package 2 or 3. To optimise the best transfer of signal, the Audison Bit DMI can pick up the BMW’s MOST signal and convert it to a Toslink optical output for the Audison Bit Ten D. This will retain the utmost signal integrity and keeping the audio controls built into the OEM head unit such as volume, balance and tone controls – as well as the hands-free kit, navigation system and parking sensor alerts unaltered. Going down this route requires the Audison Bit Ten Processor Option. No high-level speaker inputs, No internal BMW amplifier, just pure Full Digital Audio Signal. This costs a further £749.99 fully installed. (This includes us changing the Audison Bit Ten to the Bit Ten D) This is also covered with us under the 3 year Four Master Dealership Warranty. All the above packages are not inclusive of the factory tweeter mounts if required. When installing the Bit DMI, depending on specification of the car, it may require coding if a MOST amplifier is not factory provided with the car. If coding is not performed the DMI will not work. Contact us to find out more. We are now offering 0% Finance on 6, 9 & 12 Months. All the above packages are what we recommend based on our extensive experience with BMW’s. They produce awesome results and will not disappoint. However, if you want something tailored for you please call us on 01189 866 224 or email us at info@johnkleis.com and we will talk you through options.